At sixteen, Mina's mother is dead, her magician father is vicious, and her silent heart has never beat with love for anyone--has never beat at all, in fact, but she'd always thought that fact normal. She never guessed that her father cut out her heart and replaced it with one of glass. When she moves to Whitespring Castle and sees its king for the first time, Mina forms a plan: win the king's heart with her beauty, become queen, and finally know love. The only catch is that she'll have to become a stepmother. Fifteen-year-old Lynet looks just like her late mother, and one day she discovers why: a magician created her out of snow in the dead queen's image, at her father's order. But despite being the dead queen made flesh, Lynet would rather be like her fierce and regal stepmother, Mina. She gets her wish when her father makes Lynet queen of the southern territories, displacing Mina. Now Mina is starting to look at Lynet with something like hatred, and Lynet must decide what to do--and who to be--to win back the only mother she's ever known...or else defeat her once and for all. Entwining the stories of both Lynet and Mina in the past and present, Girls Made of Snow and Glass traces the relationship of two young women doomed to be rivals from the start. Only one can win all, while the other must lose everything--unless both can find a way to reshape themselves and their story. "Girls Made of Snow and Glass is like reading a particularly wonderful and vivid dream, complete with imaginative magic, delightful characters, and beautiful language. Melissa Bashardoust's debut novel is everything a fairy tale should be." --Jodi Meadows, New York Times bestselling coauthor of My Lady Jane "In Girls Made of Snow and Glass, Melissa Bashardoust has given us exquisite displays of magic, complex mother-daughter relationships, and gloriously powerful women triumphing in a world that does not want them to be powerful. A gorgeous, feminist fairy tale." --Jodi Meadows, New York Times bestselling coauthor of My Lady Jane "Simply beautiful. Girls Made of Snow and Glass is like reading a particularly wonderful and vivid dream, complete with imaginative magic, delightful characters, and beautiful language. Melissa Bashardoust's debut novel is everything a fairy tale should be." "YOU NEED THIS BOOK. YOU WANT THIS BOOK. This is the timely feminist Snow White you'll want to tell your children. It's more magical than the original, and more imaginative than any Snow White retelling I've read. Girls Made of Snow and Glass is fabulous. And it's absolutely not what you're expecting." 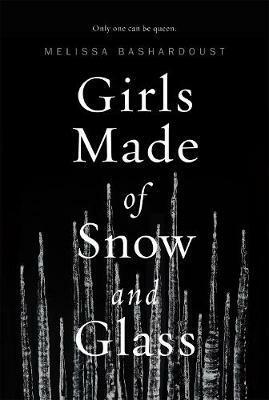 "I cried three times and now I'm going to gush: Girls Made of Snow and Glass is such a beautiful book. I am so excited for it to be out in the world." "I loved Girls Made of Snow and Glass the magic, the atmosphere, the feel of a classic fairy tale. I seriously can t wait to staff pick it when it comes out. "OMG, I loved it. Anyone who loves Wicked will love Girls Made of Snow and Glass, too.
" "YOU NEED THIS BOOK. YOU WANT THIS BOOK. This is the timely feminist Snow White you'll want to tell your children. It's more magical than the original, and more imaginative than any Snow White retelling I've read. Girls Made of Snow and Glass is fabulous. And it's absolutely not what you're expecting." Melissa Bashardoust received her degree in English from the University of California, Berkeley, where she rediscovered her love for creative writing, children's literature, and fairy tales and their retellings. She currently lives in Southern California with a cat named Alice and more copies of Jane Eyre than she probably needs. Girls Made of Snow and Glass is her first novel. Visit Melissa online at www.melissabash.com.